It has been a busy start to spring at A. Crane Construction! 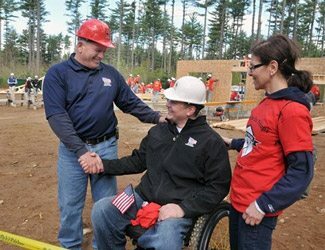 We volunteered our time to coordinate and execute the construction of a new home for Marine Sgt. Joshua Bouchard. The native of Amherst, MA was severely injured by an IED during his second tour in Afghanistan in 2009. Click here to view our photo gallery of the project in progress. To learn more, please click the links below to view the news coverage on our community’s efforts to give back to the heroes who serve our country. If you would like to volunteer supplies, or your time or particular expertise, please contact us!